What makes a neighborhood? What keeps it ticking along as a functional unit? Is it the collective meticulous care of the homes and lawns? Is it the people who care for those homes and lawns? Or is it the dynamics between the people? And what does it take to tear that neighborhood apart? This is what Professor Eric Charles May explores in his debut urban novel Bedrock Faith. Professor May carefully treads that fine line between satirical humor, sentimentality, political commentary, absurdity, and horror, creating subtle suspense that is only outshined by his ability to create memorable characters. The cast of neighborhood characters revolves around the always practical Mrs. Motley, a retired school librarian “with a body that kinder neighborhood souls called slender and harder hearts labeled as bony,” who is unfortunate enough to live just a glance-out-the-window away from the infamous Gerald “Stew Pot” Reeves. The neighborhood is all in a tizzy when after 14 years in prison, 31-year-old Stew Pot returns to Parkland to live with his mother. A troubled and dangerous youth, Stew Pot now claims to be deeply religious and repentant. Upon his return, he personally and insidiously takes on the task of apologizing for his past transgressions while attempting to bring the people of Parkland into “The Light” he found while in person. His unbridled evangelism starts innocently enough when he borrows a bible from Mrs. Motley, but then quickly escalates as he becomes the self-appointed moral judge and executioner of the neighborhood. Stew Pot’s actions become more bizarre and disturbing as he attempts to save the immoral souls of one neighbor after another. The neighborhood begins to implode as its already suspicious and increasingly malicious members begin to fight back against Stew Pot. One of the things that keeps this book clicking is the uncertainty—Is there true, but misguided, goodness in Stew Pot? Or is he simply evil hiding behind the name of the Lord? Bedrock Faith could so easily be a compelling story of redemption and forgiveness, but many will be disappointed by the ending. What starts out as an enticing tale unfortunately becomes increasingly uncanny. Slowly shifting into cliché, Bedrock Faith becomes a stigmatizing narrative of a man suffering from mental illness who is ultimately, and rather lamely, portrayed as nothing more than violent and dangerous. 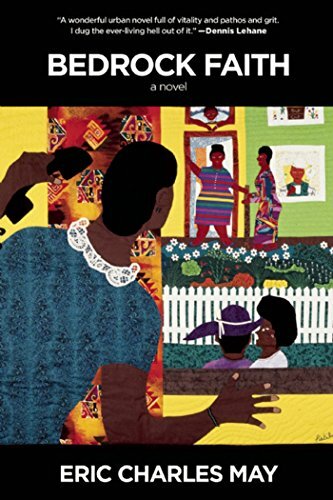 In spite of the bad taste left by the last one-third of the book, the depth and the magnetism and the humor of Eric Charles May’s truly unforgettable characters makes this a neighborhood well worth visiting. Karen Winters Schwartz’s most recent novels are the critically acclaimed Reis’s Pieces: Love, Loss, and Schizophrenia and The Chocolate Debacle..